David Hamilton was the featured attraction at UFCU Disch Falk Field on Friday. Following a beating of Baylor, however, his Texas teammates also took a bow. Texas spotted Baylor four early runs but rallied to a 9-5 triumph in the opener of a three-game series. DJ Petrinsky and Tate Shaw both contributed three RBIs for UT, and Duke Ellis had four hits. Hamilton made a key defensive play in the comeback. Winners of four straight games, Texas (20-12; 7-3) had opened this month with wins over McNeese State and Texas A&M-Corpus Christi. Texas announced a crowd of 5,391 on Friday, and 1,000 of those fans received a promotional shirt that honored Hamilton. The shirt played on the Playbill program for Hamilton, the successful musical. The shirt featured the words “Play ball” and a silhouette of Hamilton making a defensive play. Hamilton, who has never seen the musical he shares a name with, went 0-for-3 with a walk against Baylor. His glove, however, prevented Baylor from building on its 4-0 lead in the third inning. With the bases loaded and one out, Hamilton started a double play after fielding a grounder that bounced off the pitcher’s mound. 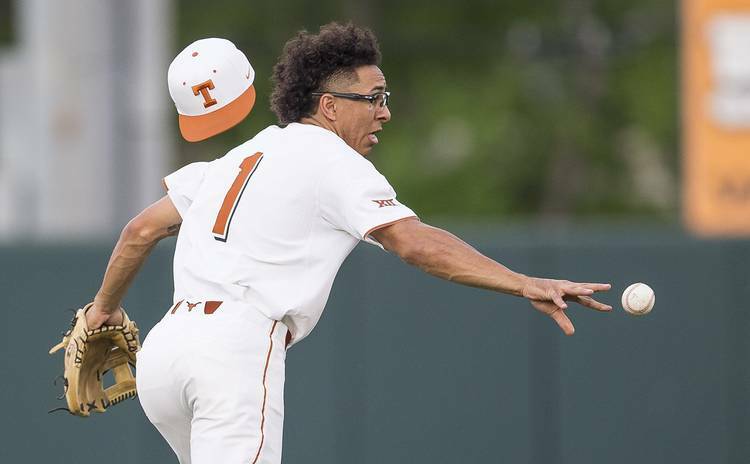 After the game, Texas coach David Pierce said Hamilton was “the best in the country.” Pierce later added that he hadn’t coached a shortstop of Hamilton’s caliber since he was an assistant during Paul Janish’s time at Rice. Janish played in the major leagues from 2008-17. UT got a two-run home run from Petrinsky in the third inning. Two innings later, Shaw tripled home two runs during a four-run frame. Texas never relinquished its 6-4 advantage and scored three more times in its final at-bat. A 13-hit effort on offense made winners of the UT bullpen, which allowed five hits and a run over seven innings. Four Longhorns were used to relieve Texas ace Nolan Kingham, who logged only a two-inning start for the second straight week. Four days after picking up his first career win, junior Parker Joe Robinson was once again the pitcher of record. Freshman Bryce Elder earned his first career save after throwing two innings of one-hit baseball. Around the bases: Baylor (14-14; 3-7) was led by designated hitter Richard Cunningham, who graduated from nearby Austin High in 2014. Cunningham went 4-for-5 and two of his homecoming hits were home runs. … Texas freshman Zach Zubia singled in the sixth inning to extend his on-base streak to 31 games. … Shaw is now responsible for four of Texas’ 12 triples. … UT announced on Friday it had added high school infielders Lance Ford, Tanner Haney and Greyson Lembcke and Houston Stratford catcher Caston Peter to its 2018 recruiting class.